Apple may be best known as a consumer technology brand, but Brandon Larry, Apple Mobility Solution Specialist, told attendees at the recent CDW Canada BTEX 2018 show in Toronto that Apple products are also a great choice for business users. Apple solutions are deployed in many enterprises already, Larry noted. However in most cases, the products are being used mostly for email, which is unfortunate, he said, because Apple solutions are capable of a lot more. He used the example of a small, New Jersey-based telecommunications firm to illustrate his point. The company uses tablets and a range of Apple applications to make its workforce fully mobile and always connected. Managers know exactly where employees are and how many hours they’re spending on a job. This makes the company flexible and helps it compete with much larger firms. Most businesses view the IT department as a cost centre, Larry said. They don’t expect it to generate revenue. Apple believes it can flip that notion on its head by simplifying hardware and software deployment to give businesses an immediate, low-cost boost to productivity. Recently Apple helped a Canadian retail customer roll out 4,300 phones across the country. Typically such a rollout would require a major effort from the IT department. In this case though, the IT department didn’t need to play a role. The phones were shipped directly to employees who handled the setup themselves. Another great example of a significant Apple deployment requiring little support from the IT department, Larry noted, is IBM, which has the largest installed base of Mac computers in the world. IBM’s Macs are shipped across the country to each user and deployed without the IT department having to become involved. Similar PC deployments within IBM cost approximately $500 per machine, Larry said. explained. The vendor has 235,000 business applications in its app store, and it invests in its business app ecosystem by identifying key partners and helping them enhance their applications. This gives Apple business customers access to great native applications they can deploy almost immediately, rather than having to spend time and money developing or customizing their own apps. Businesses today need mobile workforces in order to boost their flexibility and competitiveness, Larry said. Apple helps them maximize their mobility while minimizing their deployment costs with devices that have access to a great built-in application ecosystem and are simple to deploy and manage. 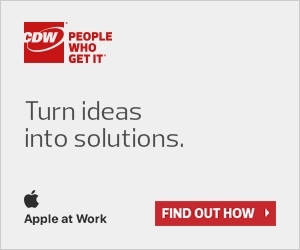 Check out CDW Canada’s Apple Solutions section for more information.